The holidays are nearing and there is a lot to get done. Many people add holiday decor to that list. Everything from tinsel to the plastic reindeer come out of storage. What can seem the most cumbersome though, outside of maybe trekking home with a large evergreen tied to the roof of your car, is putting up the holiday lighting in Scottsdale, AZ. Here are some tips to ease your holiday lighting blues. Start out with lights and extension cords that are UL approved for the outdoors. These higher grade lights are bit more costly, but they last longer, are safer, and have better performance. Also take into consideration the effect lights will have on your electric bill. Regular C7/9 lights that are commonly on sale during the holiday season are the least energy efficient. You may save on the cost of the lights, but that savings may quickly dissipate with the increase to your monthly electric costs. Incandescent mini-lights are more efficient than the C7/9s. LED lights are the most efficient of all. Plan ahead with the design. It is always best to start with mapping the electrical outlets and then design your lighting plan from there. Creating a plan, or worse, getting started, and then finding there is no way to make it work, is needlessly time consuming and frustrating. Make sure you are not exceeding the maximum electrical capacity of each circuit. Typically, 15 or 20 amp circuits are what most homes are fitted for. When installing lights in trees and bushes be sure to do so carefully, in a way that will not damage them. Think about how you will take the lights out, as you lay them. It can be more damaging to a tree or shrub to remove tangled lights than it was to install them. Make sure nothing is intertwined so much that it will cause tearing to be removed. Likewise, be sure the added weight is not too much for the plant. These tips should save you some time and headache as you also save on your energy bill. They will help you create a safe lighting theme that will knock the socks off your neighbors! Of course, if it all seems too overwhelming or you simply don't have the time, we are here to help. Designing, planning, installing, and removing holiday lighting in an efficient and safe way is all part of the process. Calling in a professional lighting company can be well worth the time and money you save. Not having to buy your own lights, getting the most efficient lighting, as well as having the peace of mind that comes with knowing it was all installed safely are some big benefits of not doing it yourself. 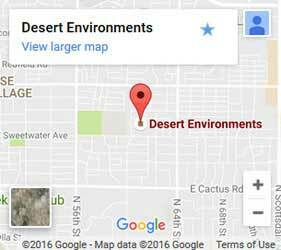 Call Desert Environments for any assistance you may need to get your Scottsdale, AZ holiday lighting up and running as well as removed safely.